4lch3m1st - Islamic lectures and sermons. Al-Masdar News - Providing the latest news and analysis from the Arab world. al-bab - Gateway to the Arab world. Arab Governance Report II: Governance and Institutional Transformations in Conflict-affected Arab Countries - This report discerns priority issues for a conflict-sensitive approach to governance. It identifies four groups of priority institutions for reform. First, security institutions should strive to become professionalized, develop a centralized military command structure and be put under civilian accountability. Secondly, administrative institutions need to enact mechanisms that ensure that recruitment and promotion follow meritocratic rules and that they are autonomous and independent from political influence. Thirdly, judicial institutions must be independent, transparent and efficient, and able to provide equal access to all. Finally, political institutions need to include coherent, democratic and representative political parties, as well as strong, independent legislative bodies. The report concludes by proposing to establish an observatory of institutional reform to monitor the main institutional dimensions of a transformation out of conflict. Arabic Literature (in English) - Marcia Lynx Qualey's literary blog aimed at non-Arabic readers seeking a deeper understanding of Arabic literature and culture. As'ad AbuKhalil - Lebanese-American professor of political science at California State University, Stanislaus. AbuKhalil is the author of Historical Dictionary of Lebanon (1998), Bin Laden, Islam & America's New "War on Terrorism" (2002), and The Battle for Saudi Arabia (2004). He maintains a blog, The Angry Arab News Service. American-Arab Anti-Discrimination Committee - Works in every sphere of public life to promote and defend the interests of the Arab community. Arab American News - Based in Dearborn, Michigan. Showcases news and features from all over the Arab World, including social, political, cultural and religious themes. Arab Fund for Economic and Social Development (AFESD) - An autonomous regional Pan-Arab development finance organization, (the Fund). Its membership consists of all states who are members of the League of Arab States. Its function is to assist the economic and social development of Arab countries through (1) financing development projects, with preference given to overall Arab development and to joint Arab projects; (2) encouraging the investment of private and public funds in Arab projects; and (3) providing technical assistance services for Arab economic and social development. Arab German Consulting - This site provides updated information and links concerning Arabic Countries and Germany. It is dedicated to exporters, importers, manufactures, buyers, sellers and opportunity seekers. Arab League (The League of Arab States) - Established in 1945. It has 22 members: Algeria, Bahrain, Comoros, Djibouti, Egypt, Iraq, Jordan, Kuwait, Lebanon, Libya, Mauritania, Morocco, Oman, Palestine, Qatar, Saudi Arabia, Somalia, Sudan, Syria, Tunisia, United Arab Emirates, and Yemen. Arab Net - A collection of articles written by leading journalists and editors in the Middle East. Arab Organization for Human Rights (AOHR) - Provides legal assistance to political prisoners and and financial assistance to the families of victims. Arab Resource and Organizing Center (AROC) - A grassroots organization working to address economic, social, and political impacts of anti-Arab racism through direct services, political education, organizing, and advocacy. Arab World - Arab world business information. Arab World Competitiveness Report - Provided by the World Economic Forum. Arabian Business - Breaking regional business stories around the clock in both English and Arabic. Arabist - Issandr El Amrani blog on arab politics and culture. Asharq Alawsat - A leading Arabic news source: international edition - English. Anthony Loewenstein - Sydney-based independent freelance journalist, author, documentarian, photographer and blogger. Aqoul - Discussion, debate and general blithering on about the Middle East-North Africa (MENA) region. Angry Arab News Srervice - A source on politics, war, the Middle East, Arabic poetry, and art. Arabist - News and commentary on Arab World. Bitter Lemons - Promotes exchange of views about the Israel-Arab conflict and additional Middle East issues among a broad spectrum of participants. Electronic Intifada - News, commentary, analysis, and reference materials about the Israeli-Palestinian Conflict from a Palestinian perspective. Foundation for Middle East Peace - Nonprofit organization that promotes an enduring Israeli-Palestinian peace. 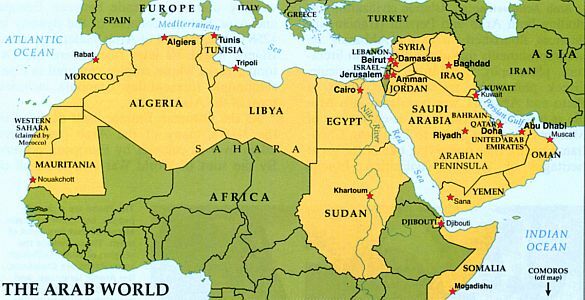 Informed Comment (Juan Cole) - Thoughts on the Middle East, history, and religion by Professor Juan Cole. Islamophobia Watch - Documenting the war against Islam. Just World News - Info, analysis, discussion- to build a more just world by Helena Cobban. Marc Lynch - Middle East scholar. MERIP - Middle East Research and Information Project. MideastWire - Offering a daily email newsletter of concise, translated briefs covering some of the key political, cultural, economic and opinion pieces appearing in the media of the 22 Arab countries, Iran and the Arab Diaspora. Missing Links - News items from the Arabic-language press to help fill in the gaps. MuzzleWatch - Tracking efforts to stifle open debate about US-Israeli foreign policy. Peoples Geography - Reclaiming Space - Promoting contemporary radical geography, a rich tradition of dissent and positing alternatives, a political movement to reclaim mind-spaces and virtual spaces, as well as public (physical) space. Political Islam - Dedicated to promoting timely understanding and debate on a broad spectrum of ideas and trends in Islam and the Arab World through filtration, translation and analysis of original language texts. Rootless Cosmopolitan - Tony Karon. Sabbah's Blog - Politics, media, business, Middle East, Palestine, Israel, Zionism, world news, and is a top destination for news, blogs, and original content related to Middle East conflict. Sic Semper Tyrannis - A daily journal of thoughts and messages from the "muffled zone" that media management has made of our country by Colonel W. Patrick Lang. Syria Comment - Thoughts on Syrian politics, history and religion by Prof. Joshua Landis. The Angry Arab - As'ad AbuKhalil, professor of political science at California State University, Stanislaus. The Arabist - Covering the politics and culture of the Arab world. War in Context - Iraq + war on terrorism + Middle East conflict + critical perspectives. Caabu - Works to advance conflict resolution, human rights and civil society in the Arab world through informed debate and mutual understanding. Cafe Arabica - Arab American online community center. Conflicts Forum - Works through three channels: the Roberts Center Dialogues, the Islamic Economics Program and the Media and Public Discourse Program. These three channels enable Conflicts Forum and its associates to engage in substantive discussions with Western policymakers and the leaders of political Islam. Its reach goes well beyond the Middle East, working with Islamist groups in North Africa and Pakistan and with Islamic political movements in South and East Asia as well. Cooperation Council for the Arab States of the Gulf (Wikipedia) - The GCC is a political and economic union of Arab states bordering the Persian Gulf, namely Bahrain, Kuwait, Oman, Qatar, Saudi Arabia, and the United Arab Emirates. Also see Global Security's profile. Council on American-Islamic Relations (CAIR) - CAIR's mission is to enhance understanding of Islam, encourage dialogue, protect civil liberties, empower American Muslims, and build coalitions that promote justice and mutual understanding. Also CAIR Chapters page. European Muslim Network - Gathers Muslim activists across the continent, who share common concerns and commitments related both to the Islamic tradition and the European societies. Gulf Today, The - A 36-page English-language daily newspaper based in the United Arab Emirates. Halal Tube - Islamic lectures, videos, audio. IKhwanWeb - The Muslim Brotherhoods only official English web site. The main office is located in London, although Ikhwanweb has correspondents in most countries. Islamic Artists Society - Creative Muslims dedicated to the promotion and cultivation of Islamic Art through all creative genres and disciplines. We welcome all Muslims who are seeking to educate and create awareness of Islam through all of kinds of various tools and media. Islamic Jihad Movement in Palestine - A small Palestinian militant organization. The group has been labelled as a terrorist group by the United States, the European Union, the United Kingdom, Japan, Canada, Australia and Israel. Their goal is the destruction of the state of Israel and its replacement with an Islamic state. Islamic Monthly - A nonreligious, U.S. based publication that fosters discussion on a broad range of issues and concerns related to Muslims in the modern world. Keffiyeh - Wikipedia backgrounder. The keffiyeh is a traditional Middle Eastern headdress fashioned from a square, usually cotton, scarf. It is typically worn by Arab men, as well as some Kurds and Jews. The keffiyeh has been worn by Arabs residing in regions in Arabia, Jordan, and Iraq for over a century, but its prominence increased in other regions in the 1960s with the beginning of Palestinian movements and its adoption by Palestinian politician Yasser Arafat. Koran - This is an electronic version of The Holy Qur'an, translated by M.H. Shakir and published by Tahrike Tarsile Qur'an, Inc., in 1983. Leb.Net - Links to Arab and Arab-American organizations. Muslim Brotherhood - Wikipedia backgrounder. Muslim Voices - A project of Indiana University comprised of various initiatives and activities that are all dedicated to promoting understanding and dialogue between Muslims and non-Muslims. Muslimmatters -Provides educational material, social commentary, and religious inspiration related to Islam and Muslims through its group blogging platform. National, The - United Arab Emirates news source. National Council of Arab Americans (NCA) - Aims to be a unifying framework for the Arab-American community across gender, racial, religious and socio-economic backgrounds through multi-level political empowerment, chapter-based grassroots democratic mobilization and accountability, and need-based service programs. National Network for Arab American Communities (NNAAC) - A national consortium of independent Arab American community-based organizations. New Arab, The - A leading English-language source of Middle East news, views and analysis. Rebel Economy - Farah Halime's blog, a business journalist based in Cairo. "Will Tunisia, Egypt, Libya and Yemen simply reform their old systems or come up with ideas to transform their economies?" Sada - Original, bilingual analysis of political change and reform trends in the Arab world from leading thinkers and new voices in the region. Published by Carnegie Endowment for International Peace. Tahrir Squared (T2) - Combines original content by leading analysts, journalists and authoritative commentators, and curated content carefully selected from across the web to provide activists, researchers, observers and policy makers a catch-all source for the latest on the Arab revolutions and related issues through an interactive, virtual multimedia platform. The American Muslim (TAM) - Posting news and articles of particular concern to Muslims in America and the West. The 19th Brumaire - Jamie Allinson's blog about politics, political economy and revolution, especially in the Arab world. United Arab Emirates (UAE) - This is the official website for the Ministry of Information and Culture in the United Arab Emirates. The site is a vast on-line resource providing detailed information on all aspects of the UAE. World Almanac of Islamism - A comprehensive resource designed to track the rise or decline of radical Islam on a national, regional and global level. Maintained by The American Foreign Policy Council. This webpage last updated on Monday, April 17, 2017 11:03 AM.